It was 1997 when the unthinkable happened to David “Fathead” Newman and his wife and manager, Karen. Four years after leaving New York City for a less hectic life in a bucolic, wooded area just a few miles south of Woodstock, New York, they lost nearly all of their possessions in a fire that engulfed their home. “It burned right down to the foundation,” says Karen. Inside, the rooms are warm and inviting, filled with attractive furnishings, whatever few possessions the couple-married 28 years-was able to salvage, and reassembled souvenirs of a life. A visitor would never guess that another building, and another set of belongings, once sat on the same spot. On the refrigerator door are dozens of photos of David with fellow musicians: Dr. John, Lonnie Liston Smith, Pharoah Sanders, Hugh Masekela, Herbie Hancock, Johnny Griffin and many others-they call it their Wall of Fame. The laundry room doubles as a veritable gallery of posters announcing gigs now in David’s past. In a large back room, overlooking the yard and opening onto a deck, sits a row of David “Fathead” Newman vinyl LP covers, albums recorded during the 1960s heyday of Atlantic Records and since. Of course there are reminders of the many years that David-only those in the music business, it seems, actually call him “Fathead”-spent in the employ of Ray Charles, and of his long tenure as a headliner. Proclamations, awards, certificates, even an old issue of JazzTimes with David on the cover, supply the visuals-Newman’s 60 years as an in-demand saxophonist and flutist, both as leader and collaborator, have earned him a commendable array of honors. Now that he’s turned 75, “and my body is slowing down,” says David, the touring occurs less frequently. When he does need to get someplace, or lands a Manhattan recording date, New York and its airports are only two hours down the road. “Sometimes we’ll play in the city and come right back but most of the time we’ll stay overnight,” he says. Either way, once they park the car and hang their coats in the “mud room” that serves as the entrance to their home, David and Karen Newman are in their element. Karen: David likes to go to the dump. I mean, he really loves the dump. David: I don’t really love the dump but it’s something I look forward to doing. 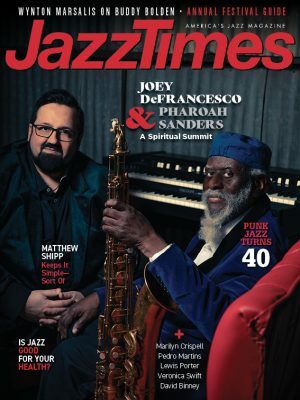 Jazztimes: What do you find there? David: Absolutely nothing. We don’t have trash pickup at home so I drive the car to the transfer station and I look forward to going to the different areas and sorting out where the garbage goes and where the glass goes and the brown paper bags and all the junk mail. I think Karen thinks I get more out of it than I actually do. Karen: Well, he comes back looking rather satisfied, I must say. He has a big grin on his face. David: I never experienced anything like this before moving to this area, but I love the plants. I developed a green thumb. We grow indoor plants and outdoor plants, mostly perennials. I’ve come to realize that they’re living things and it’s good to watch them grow and go through changes. Karen: In the wintertime he’ll bring a lot of stuff in and it’ll grow all year ’round, like geraniums. Then he’ll let them out again in the summertime. It’s a ritual, bringing the plants in and out. He’s very caring about that. When we’re away on a road trip, we have neighbors who water the plants, and as soon as we set foot in the house he looks at the plants. The plants are a serious matter. Jazztimes: Do you ever go out in the yard and play music for the birds and the deer? David: Very seldom. Sometimes I take the flute. Karen: But he listens to the birds and whistles to them. Jazztimes: Do they whistle back? David: Yeah, they do. They listen and see me imitating them and then, pretty soon they recognize it’s not another bird and they have a little fun with me. Karen: The squirrels talk up here too. Karen: One time David and I kept hearing this banging in the back of the house and we couldn’t imagine what was going on. There was this turkey banging his head against the door. He saw his reflection and he thought there was another turkey inside the house. He was showing that it was his turf. It was hysterical.